Sailboats are those that are propelled partially or completely by sails. There are many types and sizes of sailboats, primarily based on passenger capacity, range and type of sails. These boats use different kind of sails to harness wind power and navigate through water bodies. Sailboats can also be differentiated based on hull type. They can be monohull, a catamaran or a trimaran. The other factor is the type of keel it has - wing, centerboard, etc. Sailing is a very popular hobby especially in seashore areas, and sailboats can also be categorized based on whether they’re made for racing, cruising or as support vessels in other watersport activities. Probably the most important design aspect of a sailboat is its sail-plan – drawings made by the boat designer or naval architect regarding the number, type and positioning of the actual sails and masts of the boat in production. The sail-plan plays a big part in governing the look, purpose, dynamics, maneuverability and integrity of the boat/ship. The main body of a sailboat is called the hull and the front and rear parts are referred to as the bow and stern respectively. Steering takes place with the rudder and the open area is the deck. Additionally, a keel plays the role of keeping the boat steady as well as keeps it running against wind power. The mast is the pole in which sails are affixed and the rigging or the ropes control the movement of the sails. Sailing is the broad term used to describe all sporting activities involving sailboats - for both competitive and recreational uses. It is also referred to as yachting or yacht racing when it comes to racing events. ‘Day sailing’ is the term given to recreational sailing during the day for few hours in a yacht or a sailboat. 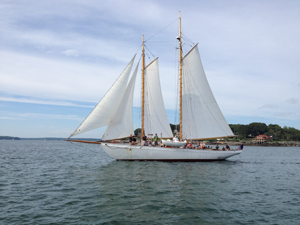 ‘Cruising’ is another recreational use of sailboats. This activity is purely for leisure pursuits and travel. It is a lifestyle pursued by many over the globe and refers to dwelling on specially built yachts or boats that are fully equipped to be floating homes or hotels. People live on board these as they adventurously travel from one place to another.